These were finished a couple of weeks ago, but I wanted to make sure the people they were intended for received them before I posted pictures. The Christmas tree 'bracelet' is actually a wearable pincushion, for sewing on the go. Or just to wear if you want to feel like a Christmas superhero. I made two of these - one for my Mumsie and another for the Mancreature's Mama. They're very simple to make, and you should be able to whip one up in about half an hour, if you need some emergency stocking fillers or gifts. By the way, I'm sorry there aren't more 'process' photos, I didn't really think about making a tutorial until I'd finished them, then I was too hungry to make another one, with photos. Please don't give me lumps of coal for Christmas. - Use the stencil to trace the shape onto the felt, then cut out two pieces, one each for the front and back. To make sure that both pieces are the same size, pin them together before cutting. - Embroider some 'stars' on the front piece of felt. You can use a washable or disappearing ink pen (like this) to map out where you want the stars to be, but I just placed them randomly. I used cross-stitch for them, first in red thread, then going over those with the yellow thread. *You can skip the next two steps if you're using ribbon or lace. - Sew the long sides of your fabric (to cover the elastic) together, making a long tube, then turn it inside out so the stitching and seams are hidden. Put the elastic into the tube (I find it easiest to use a safety pin to guide the elastic through the tube). Pinch both of the elastic and sew them together, making a circular band. Sew the ends of the fabric tube together somehow, so you get a stretchy, fabric-covered 'bracelet'. Sew this bit to the back portion of the felt tree shape. - If you're using ribbon or lace, sew it to the back of the felt tree shape as well, but you won't have to go through all that hassle with the elastic and all. You can leave the ends open so the recipient can tie it to fit their wrist. I should have thought of this when I was making my trees! - Using the green thread, start blanket stitching around the top third portion of the tree, then stuff Polyfill (or whatever you're using) into the portion that's already stitched. Keep adding blanket stitches and stuffing alternately, until all the stuffing is inside. Knot the thread neatly and securely, then cut of the ends, and you're done! Wearable pincushion tree! I don't actually have a tutorial for these, as the pattern isn't mine. I got the pattern for the hearts from here - I found her crochet hearts a lot prettier compared to most others (which are mainly made of of rows of single crochet - boring!). 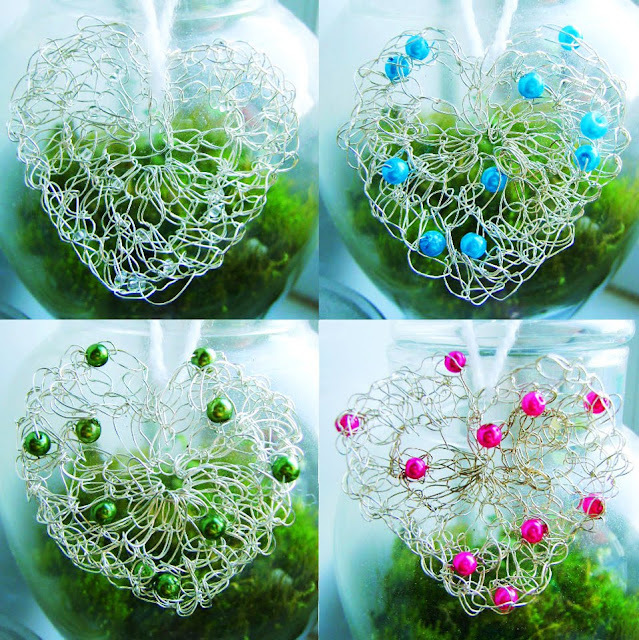 All I did was string some beads onto thin copper wire, then crochet the hearts, and add a bit of yarn to the top for hanging. They didn't take too long to make either, although I found working with the wire very fiddly. You can always make it in nice yarn if you want to be kind to your fingers.